New games in colorful packaging are unlikely to disappear entirely, but digital sales channels are becoming more and more important – especially for younger audiences. Games can be bought directly from Steam, and others, and once you've logged in to your account, you can play them immediately. Occasional bargains keep players happy, and other players are there to evaluate games. The digital distribution channel has its downside. You have to have a stable Internet connection and often download loads of files. Reselling games isn't always possible, and if a server on the provider's platform goes down, you won't be able to purchase anything. Not least are the security risks: Every now and then payment information is hacked and ends up in the wrong hands. Most people are aware of this possibility but happily live with the risks, considering the increasing number of Steam users. Steam is probably the largest of the game distribution platforms, with more than 2,000 titles and 50 million accounts (the website still claims only 40 million). Among the vendors who sell games on Steam are Ubisoft, Epic Games, Electronic Arts, id Software, Rockstar Games, Activision, and, naturally, Valve itself. The distribution of its own games (Half-Life, Counter-Strike, Left 4 Dead, Portal) was the impetus for developing Steam. It was published in 2003 and became a prerequisite for getting some Valve games such as Half-Life 2. A native Steam client for Linux was officially announced in July 2012, but was already haunting blogs and online forums before that. Until the official release, Linux gamers ran Steam with help from Wine. Steam for Linux is currently in a beta version open to all Linux players. My test resulted in an almost flawless operation with Ubuntu 12.10, although switching to "Big-Picture" mode crashed the software. To get started, you can download the Steam client from its website . At the top right, click Install Steam , and the web server should automatically detect your platform and provide the Linux client for downloading. On the next page, simply click Install Steam Now to save the Debian package locally. Software Center opens and presents you with the licensing agreement. Accept it and proceed with the installation. Ubuntu now downloads the Steam package with its dependencies and opens a window that prompts you to start the Steam client. Alternatively, you can open Steam from the Dash. Starting the client first downloads any necessary updates, which can take a few minutes. If you've never used Steam or haven't deleted the old files (see the "Removing Steam" box), you end up in a window in which you can enter a new account using Create New Account or register with an existing one with Login to existing account . The first option takes you to a registration page and the other to login lines. To remove Steam from your hard drive, open a terminal and enter the sudo apt-get remove --purge steam command. After a successful deinstallation, delete the local files in your home directory's hidden subdirectories, beginning with .steam , .steampath , .steampid , and Steam . Also delete the Steam directory in .local/share/ . After logging in, you come to an empty window that shows the available games. To buy a certain game, just enter its name in the top left search bar. To view all games available for Linux, click Store and then Linux on the right (Figure 1). The store gets new games and game accessories every day; click Top Sellers to get a list of the more popular ones. Figure 1: New games and add-ons appear daily in the Steam store. You can use the Steam | Settings menu and Interface tab to set the game language, although you have to restart Steam. Clicking a game provides information about it. Steam might require that you install the newest Flash player to view certain content. If you've already installed a Flash player, you need to close the browser, remove the adobe-flashplugin package in Software Center and replace it with the flashplugin-installer package. To purchase a game, move it as usual to the shopping cart and follow the instructions. Apart from PayPal and credit cards, Steam allows for (controversial) instant money and payment by mobile phone. 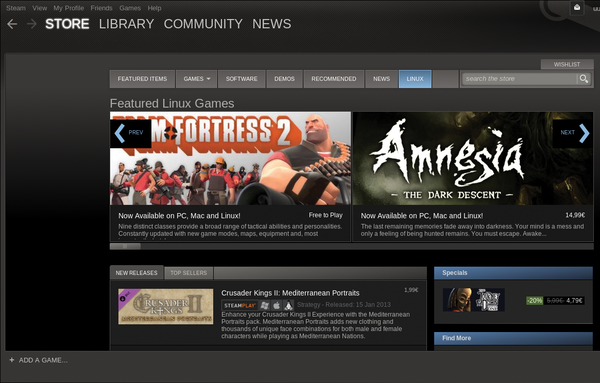 Steam for Linux rolled out as a beta release at the end of 2012. Now that the official Steam for Linux client is out, we show you how to get started with this powerful multi-player gaming system.